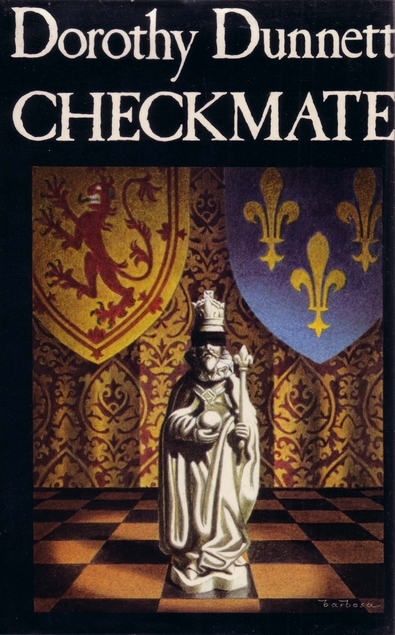 Checkmate by Dorothy Dunnett is the sixth and last book in Dorothy Dunnett’s Lymond Chronicles although in truth this series could just as easily have been named Philippa’s Chronicles. It was first published in 1975. I loved this series and although I rarely re-read books as I have too many books that I want to read for the first time around, I can see that I might read this series again after a few years. Towards the end of this one I feared that it was going to be an unhappy ending to rival Thomas Hardy’s books, but – it wasn’t. It was however a great read. 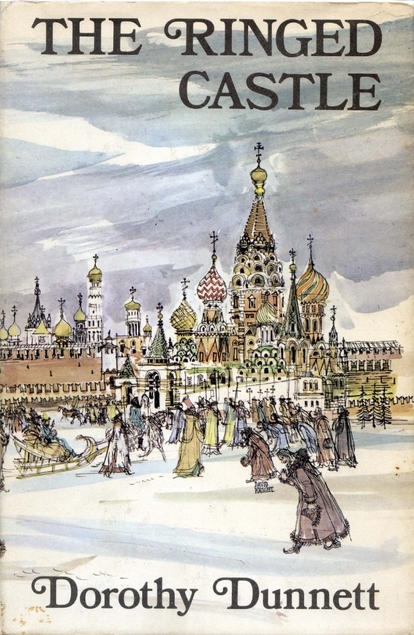 Lymond had been determined to go back to Russia where he was almost certainly going to be executed by the Tsar, his friends are determined to stop him and with Philippa’s help he is taken to France. He’s not happy about it, but they are still waiting for their divorce and have to stay there until after the marriage of Mary Queen of Scots to the Dauphin. Strangely Lymond intends to re-marry as soon as he gets the divorce. Philippa is still being pursued by the ever constant Austin Grey. But Philippa is only interested in finding out the truth of Lymond’s parentage and destroying any evidence that might be harmful to him. Lymond is leading the French army against England and Spain, but back in England Mary Tudor is in ill health and having trouble with her Spanish husband Philip. It’s a time of religious upheaval with the Protestant religion gaining converts, but they’re being persecuted for their beliefs. These books are dense with detail and not easy reads but they’re well worth the concentration needed to get the most out of them. Lymond has been suffering from migraines, almost certainly caused by stress. As a fellow sufferer I was glad to see how Dunnett described his illness. So many people claim to have a migraine when what they have is just a bad headache, nothing like a three day hell with constant vomiting at its height and often vision impairment followed by exhaustion. I feel sure that Dunnett must have suffered from migraines herself or lived with someone who did. 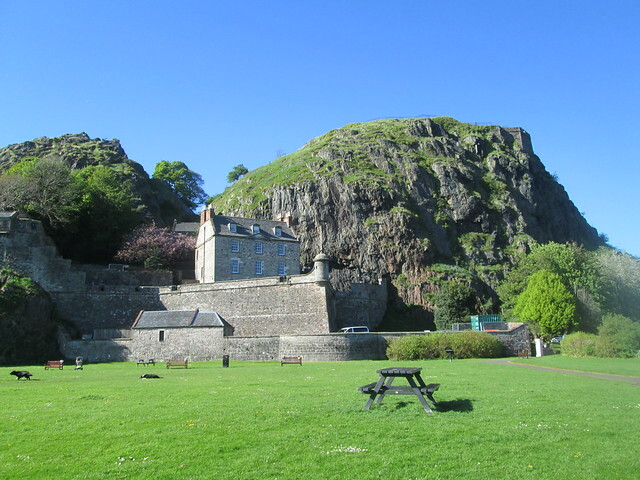 Last week I was at Dumbarton Castle which is an old friend to me as I used to play around it when I was a wee girl as I lived not far from the castle. It might be a disappointment to some people as it’s not much of a castle really, well not like Edinburgh or Stirling. 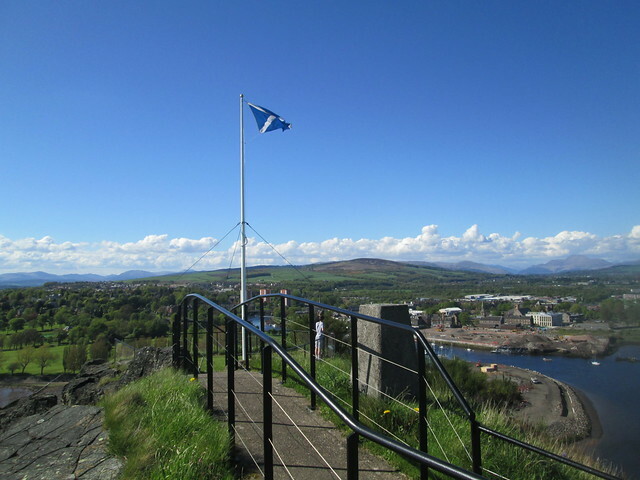 But Dumbarton was the ancient capital of Strathclyde, so it’s more of a fort and has been used as such since at least AD 450. 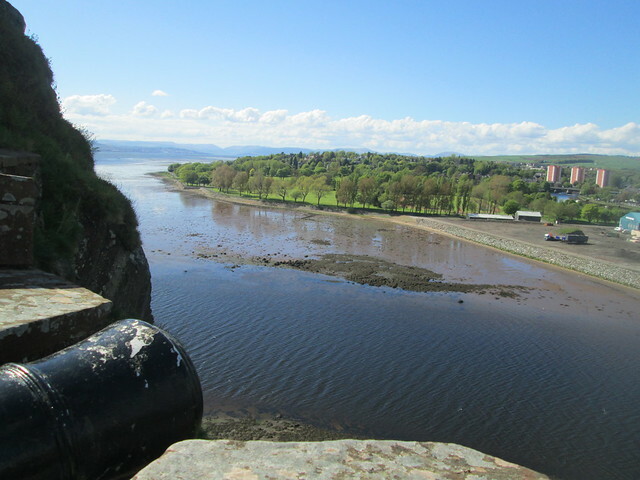 Built on a volcanic plug, as is Edinburgh, it’s located at a strategic point where the River Leven meets the River Clyde. 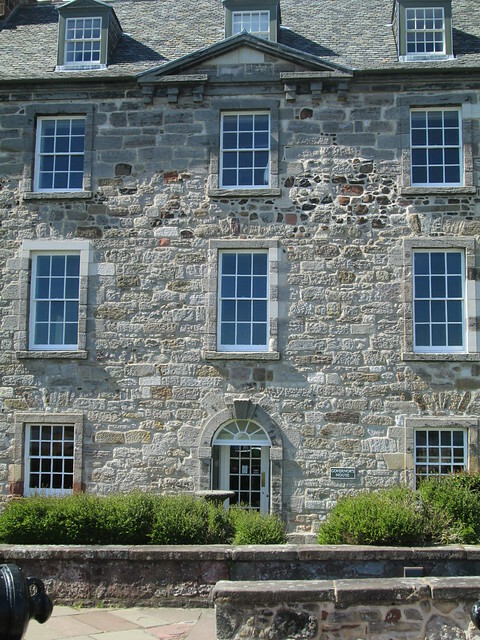 Over the centuries it has been well used and at one point a lot of French Napoleonic War prisoners were housed at the castle. 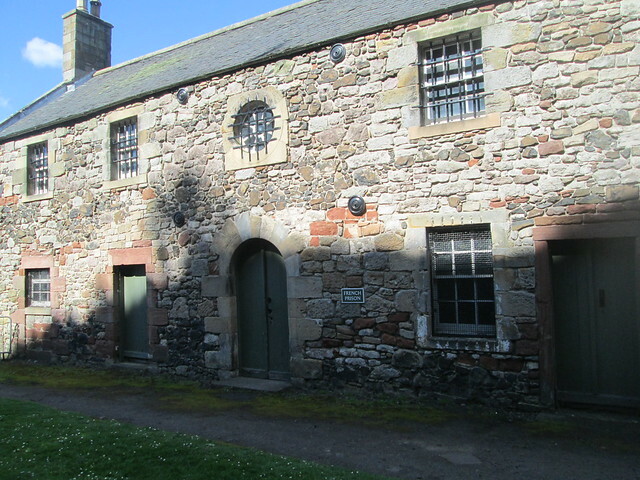 Below is a photo of the prison but I believe that they were also living in a part of the castle which is now a ruin. 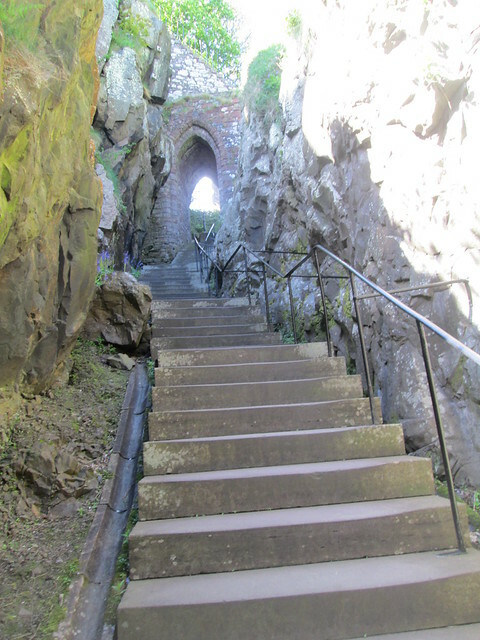 You have to be fit to visit Dumbarton Castle as it has stairs all over the place. I used to think it was 365, they said there was one for every day of the year when I was a lass, but now they must have re-counted. I’m sure I saw a sign saying 555 stairs, all I know for sure is that my knees knew all about them the next day! 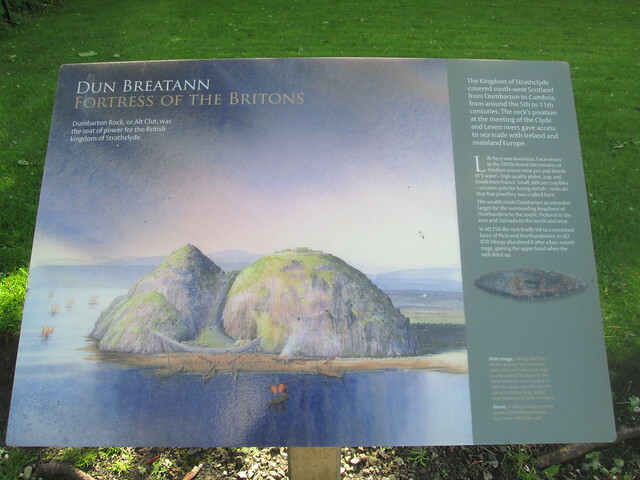 Mary Queen of Scots sailed to France from here in 1435 when she went there to marry the Dauphin. But long before that it suffered attacks from the Vikings. It’s a very historic place. I thought these photos might be of interest to people who have read Dorothy Dunnett’s Lymond Chronicles as the town is mentioned quite often in the books. Sadly the photos don’t do the distant mountains justice. A few weeks ago there was a rumour going around the town that Prince Harry and wife would be given the title of Earl and Countess of Dumbarton. Wishful thinking I thought – so I was amazed to discover today that it is indeed true. 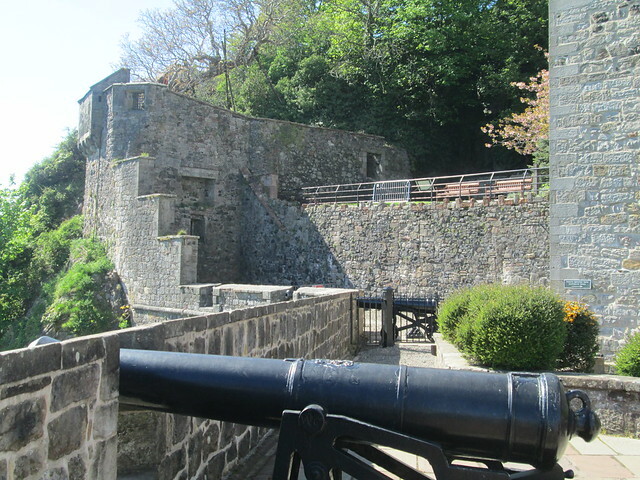 I suspect that one day they will visit the town, the Georgian house (below) within castle is still used for special events, usually by the army. I just hope that nobody shows them the actual town! 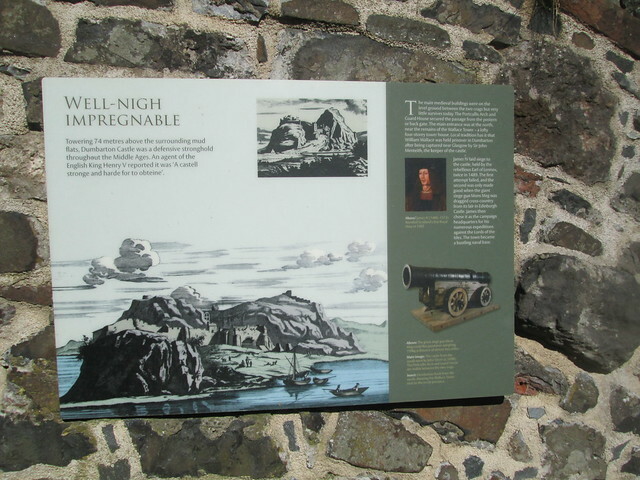 There are guns aplenty scattered around the walls and strategically placed information boards. 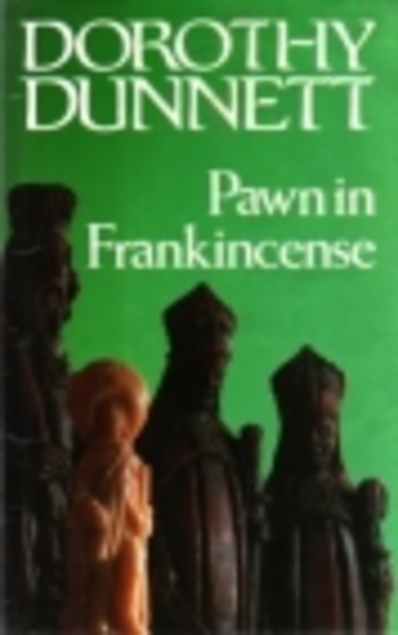 Pawn in Frankincense by Dorothy Dunnett was first published in 1969 and it’s the fourth book in her Lymond series. 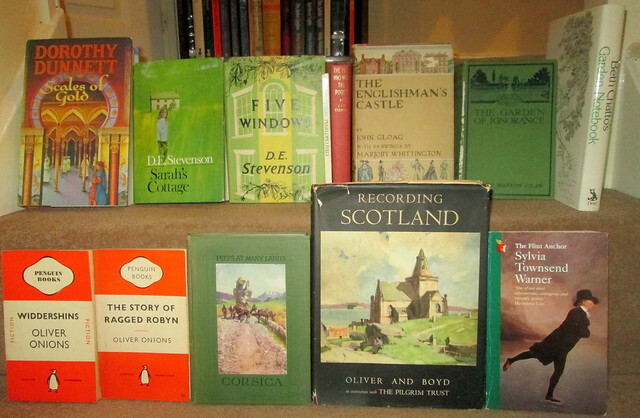 To begin with I had a look at the chapter headings to see where the story was set because I much preferred the Scottish parts of the last book, so I was slightly down-hearted when I realised that it was almost all set in the near/middle east. But I needn’t have been as this was a great read. The year is 1552. In the last book Lymond discovered that a woman he had had a brief relationship with had given birth to a son, but they’ve been captured and he’s intent on tracking them down. An old soothsayer has given him hope that his quest will be succesful. At the same time he plans to seek out Sir Graham Reid Mallett and give him his comeuppance. 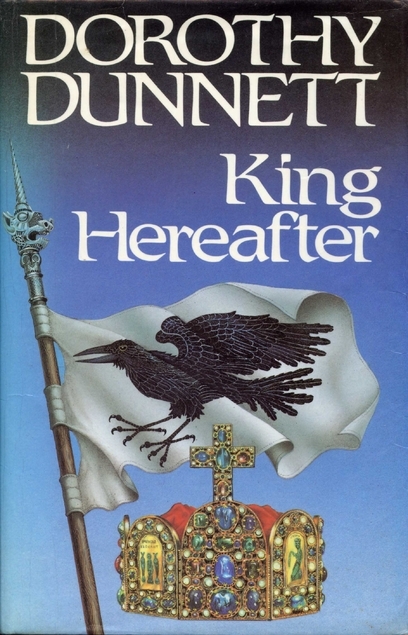 As ever with Dunnett there’s plenty of action and intrigue, right up to the very end. I’m not doing very well with my Scottish reading so far this year, this is only the second book I’ve read by a Scottish author – must do better. I was lucky and got a few books as Christmas gifts. 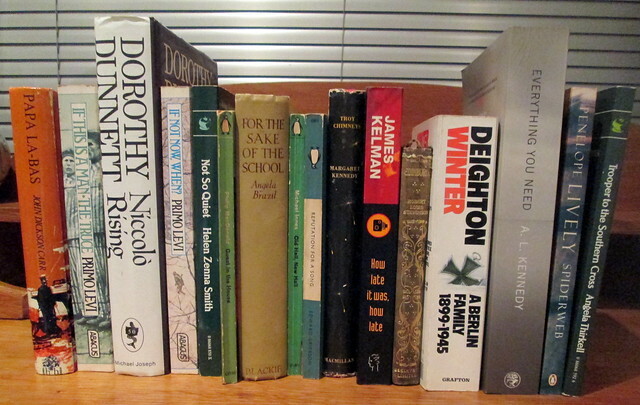 I also got Pawn in Frankincese by Dorothy Dunnett – but that one didn’t make it into my photo. 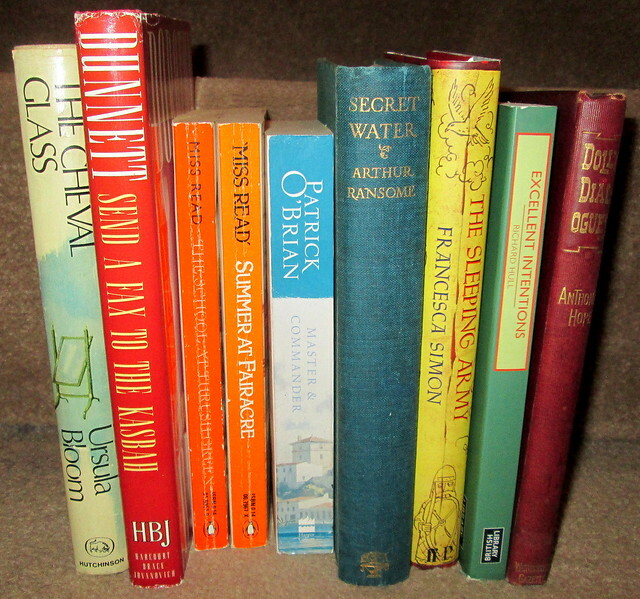 I intend to read The Oaken Heart soon, it’s the story of Margery Allingham’s village in wartime Britain. At the moment I’m reading Long Summer Day, the first book in the Delderfield trilogy. I’ve already finished reading Portrait of a Murderer but haven’t written about it yet. The old gardening book will be one for dipping into from time to time I think. This year I really want to concentrate on reading my own books, but no doubt that desperately alluring site – Fife libraries catalogue will lure me into temptation at some point! 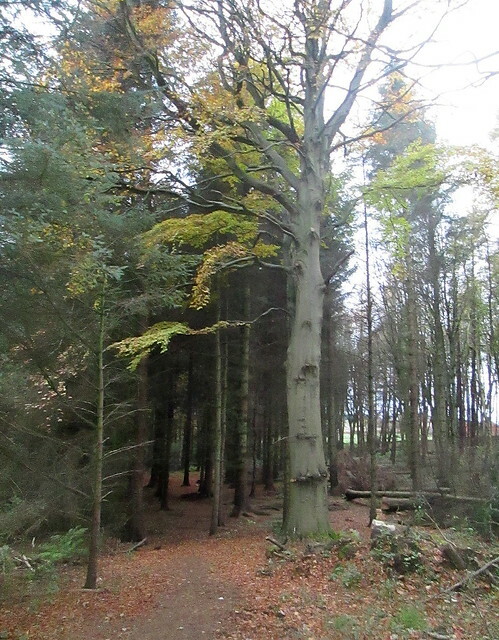 Come on – how about coming with me on a wintry walk in Fife, it’ll help blow the cobwebs away! 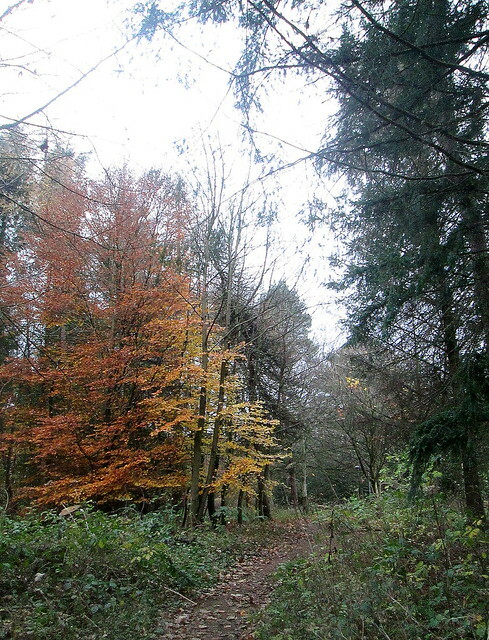 One afternoon a couple of weeks ago during a really cold snap we went for a walk in nearby woodland. 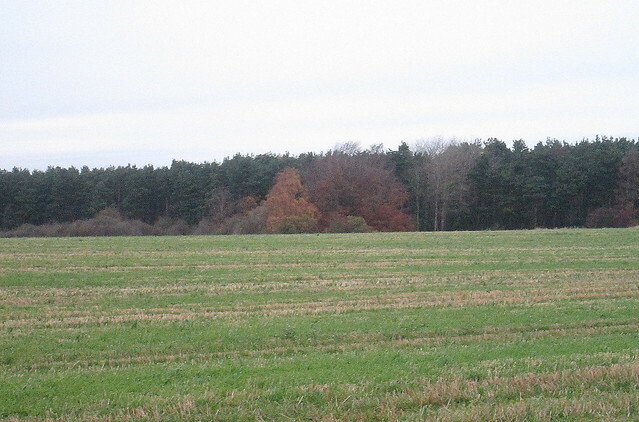 And then we left the woodland, crossed the road and set out for the open farmland surrounding the woods. 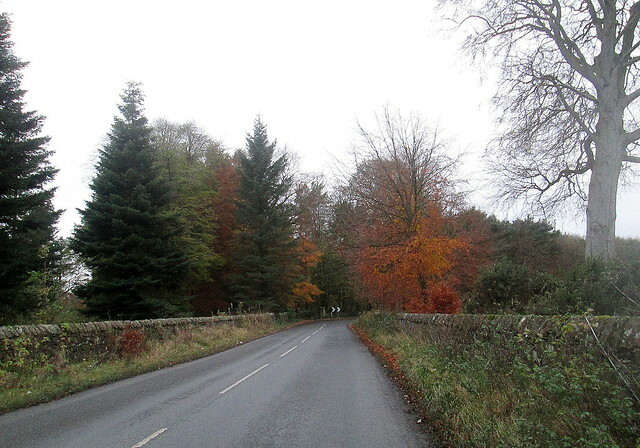 It was the middle of November but the trees were still holding onto leaves and looking quite colourful, I think some of them are beeches. 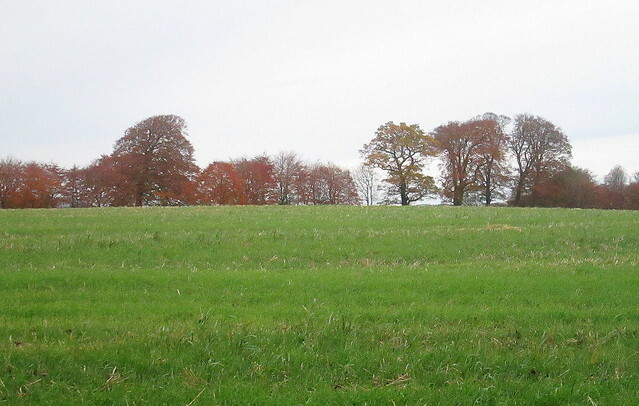 In the summer these fields will have crops of wheat, oats or barley in them. The fields had been boggy after all the rain we’d had earlier in the year but where there were tractor tracks the puddles in them had been frozen over. 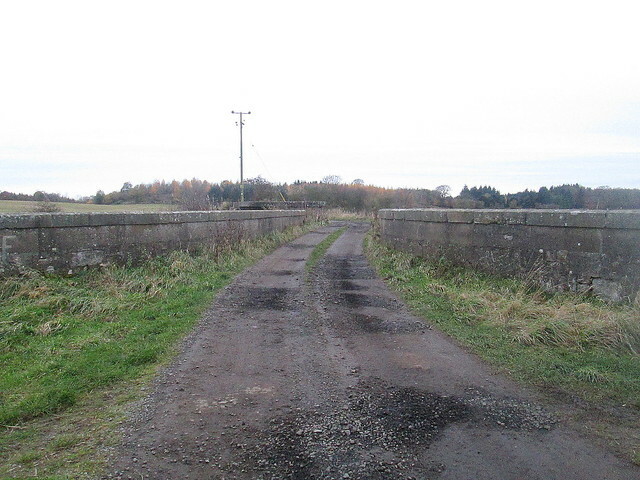 We kept to the farm track, in the photo below you can just see a small bridge that goes over a railway line, there’s a concrete and brick structure above and beside the track which looks like a World War 2 pillbox. 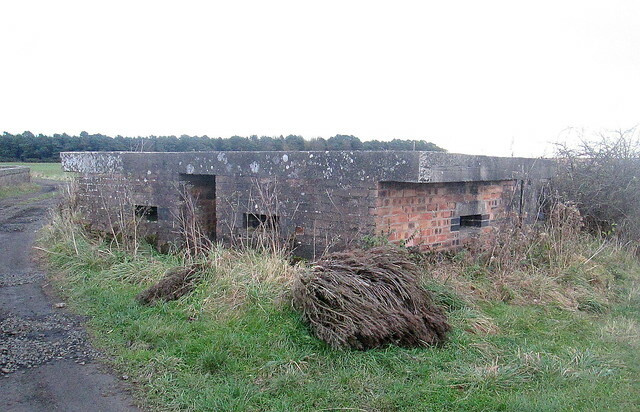 Presumably the pillbox was built to defend the track in the event of attack. 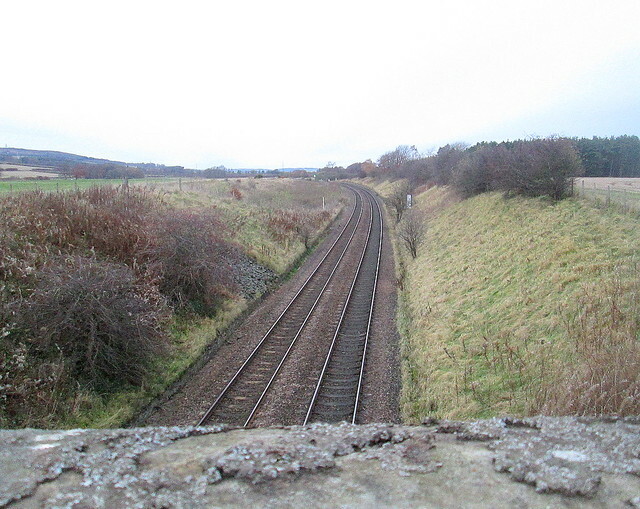 Below is the track going north. 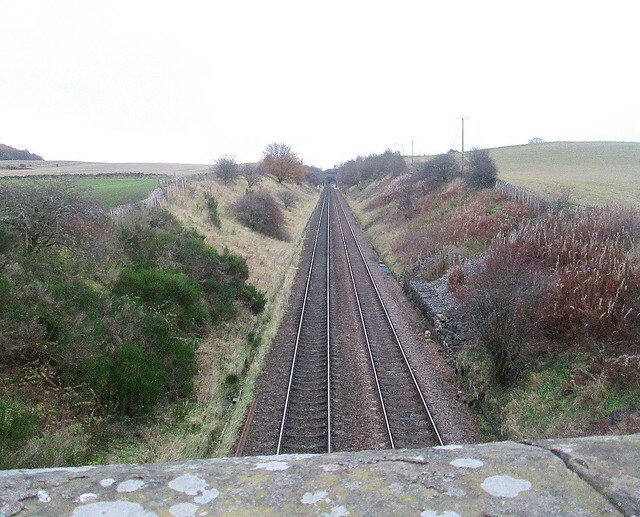 And below the track is going south to Edinburgh. 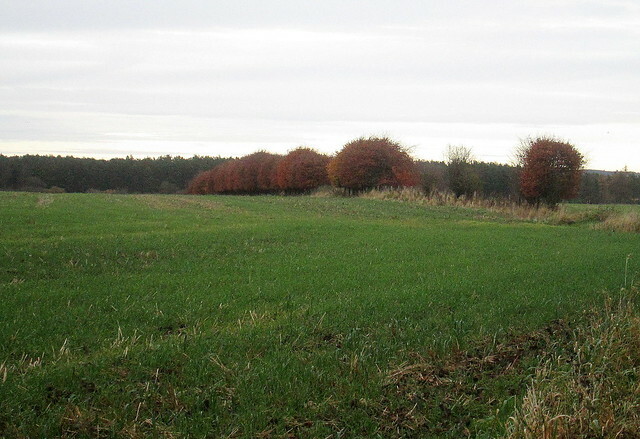 We disturbed some pheasants in one of the fields and they flew off in that awkward way they have that makes me think that anyone who shoots them for ‘sport’ is akin to a murderer as it seems they can’t fly away very well, having said that they were too fast for me to get a photo of them. By then we were frozen to the bone so we turned for home, it was coffee and cake time! 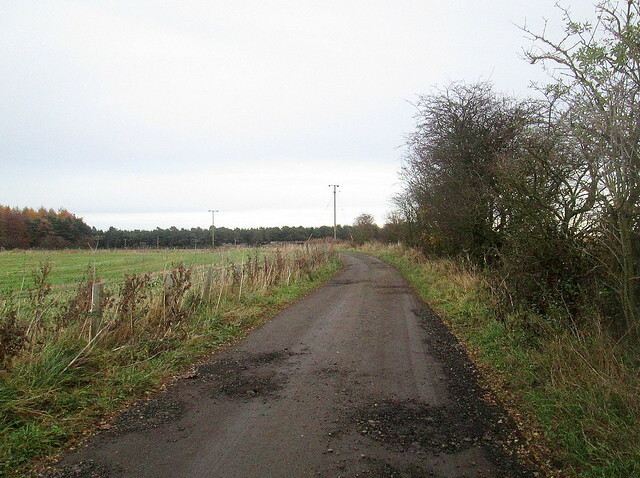 I’m sorry I couldn’t share that with you, but I hope you enjoyed your rural stroll with me in Fife.